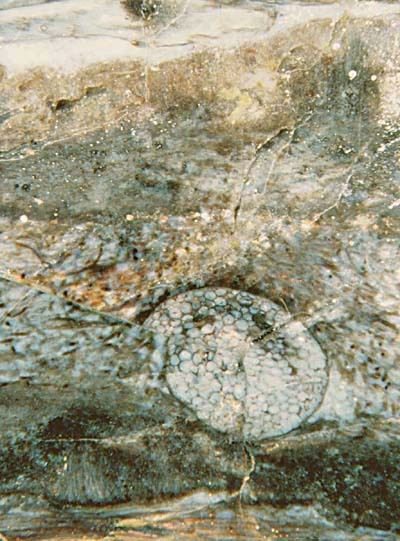 Nematophyton taiti (also spelt taitii), the first of the enigmatic nematophytes found in the Rhynie chert, has remained a very rare fossil since its discovery. It had been found as two little fragments of about 3mm and 5mm with different structure . The interpretation as different parts from one organism was a good guess. 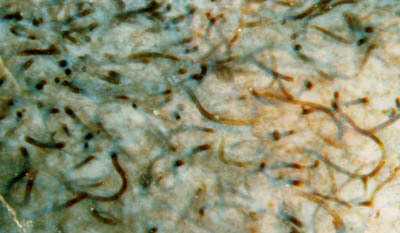 From the curved surface of one of the fragments the authors  concluded that the whole organism was probably cylindrical. A recent find resembling or representing Nematophyton taiti can give a clue as to whether this species was originally flat or bulky. Its principal structure is evident from Fig.1 where a tangle or felt of bigger tubes (Fig.2) is seen sandwiched between layers of another type. These layers mainly consist of a tangle of vaguely seen smaller tubes, with aligned bunches of what appears to be a third kind of tubes, possibly generative ones, ending at the surface, as seen below left. 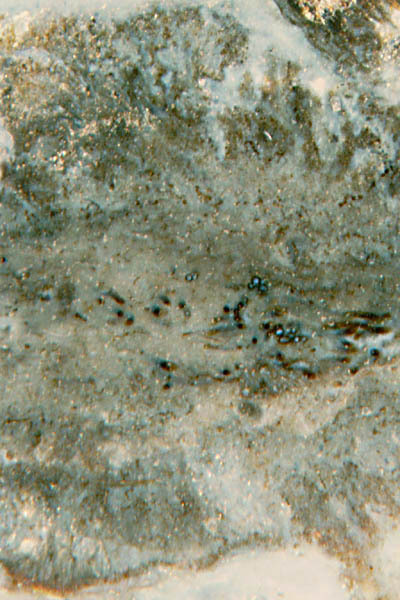 Fig.1: Nematophyte section, probably Nematophyton taiti, penetrated by an Asteroxylon root, multiply broken and displaced during silicification. Note the sandwich structure with a tangle of tubes in the middle layer and poorly seen smaller tubes above and below, and a bunch of aligned tubes below left. Height of the picture 3.8mm. Fig.2: Tangle of curved tubes, 16-24µm, in the middle layer of the nematophyte. The specimen is not well seen as a whole in the chert because of displacements before and during silicification. An Asteroxylon root grown right through the tangle of tubes serves a multiple purpose here: It shows that there are deformations of the nematophyte due to contact with other plants, and it serves an an indicator of fracture in an advanced state of silicification, with cracks running across the root and through the nematophyte. Also it proves the absence of overall compression since the deviation from its circular shape is minimal, except for the displacement after fracture. The root reveals even more details: The fragments had been displaced with respect to each other. There are displacement components perpendicular to the picture plane, which can be concluded from the aspect of the broken root. Apparently the cracks healed as the silicification proceeded. Similar distortions due to contact with plants and to fracture are present elsewhere on the specimen. The absence of overall compression can also be deduced from Fig.2, where the tangle of tubes does not look compressed. Fig.3 provides an additional argument against compression of a cylindrical shape into a flat one before silicification: The inner region with bigger tubes is seen to gradually thin out, which would not be obtained with an originally cylindrial region squeezed flat. Fig.3 (right): Section of nematophyte, probably Nematophyton taiti, with the inner layer of thicker tubes gradually thinning out and vanishing near the margin. Note also the sections of thinner tubes seen as dark dots, and the vaguely seen bunch of aligned tubes below left. Height of the picture 2.2mm. So it can be concluded that the specimen was originally flat, about 35mm wide, with thickness of about 4mm which reduces to about 2mm near the circumference. This supports the assumption that the flat aspect of the numerous coalified specimens of nematophytes found elsewhere  is not brought about by compression only. This conclusion had been offered at EPPC 2010 .